He turns sideways on my deep couch and rests his back on the armrest. This is Dad’s real conversation pose. I mimic his posture. We hold coffee and talk about the farm, our dreams, our goals, how we will build the fence for the Great Pyrenees that will guard the goats. 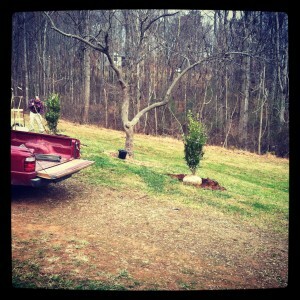 Putting the hollies in place. I’ve been dreaming practical a lot lately. Now that the vision is more solid, in the way of visions – all glory – it’s time to do the planning. We have a barn to build and trails to clear. Garden beds to install and a spring house to feature. It’s these conversations with Dad, with P, with H and S, with all of you that ground me, that feed my fire. Every time someone shares an idea – P and I saw a climbing wall in a shop on Saturday, and the man there has recommended I talk to a climbing shop to see if we can get one installed here – the dream deepens and widens, embracing more of what I feel but can’t always articulate, wrapping its arms around more of me and more of you. So these mornings on the couch with Dad, before he insulates the pump house and sketches how he will make it look like an outhouse, they are sacred time. The farm version of a vision quest, maybe, done with people I love instead of alone. Just the way I like it. Who do you dream with? I’d love to hear your dream; I have my coffee in hand. Please, share. The God’s Whisper Manifesto is now available. You can get a free copy by subscribing to this blog for the month of December, or you can buy a copy at Barnes and Noble or Amazon. All proceeds help support the dream of this place to be a working farm that also serves as a retreat for writers, musicians, and other weary souls. Thank you ALL for your support.